Don’t you love this time of year when one colourful festival follows another! Add to your celebratory mood with our special articles, beginning with a lovely floral decoration by Anuradha Pittie for Navaratri, and another for Diwali. 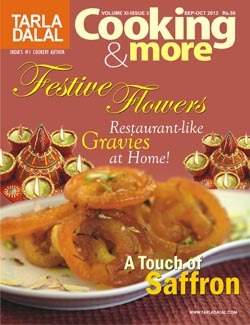 Bring colour and fragrance into your homes even as you experiment with festive fare in your kitchens! For the Festival of Lights this year we have an unusual menu comprising of waffles, smoothies and cupcakes! Surprise your guests with this unconventional offering and watch their eyes light up at this refreshing change from traditional sweets and Diwali farsaan. No festival is complete without saffron, the most exclusive of all spices, so enjoy our recipes, before checking out our other suggestions for special meals. We introduce you to three popular gravies that you can add to vegetables or koftas and create lip-smacking restaurant-like meals at home. You can also add a distinctive flavour to your menus with unusual methi fenugreek) based preparations. Remember to introduce a healthy quotient in your festive meals in the form of sprouts, which are almost 40 % more nutritious than unsprouted pulses or legumes. If you’re looking for something less elaborate how about instant idlis and dosas that require no fermenting? Serve them at breakfast time or even as mini meals when you tire of rich festive food over the next couple of months. Don’t let the stress of having everything just perfect for the festival season get to you. Take some time off to read our suggestions on how to relax, and eat right, and enjoy this special time with family and friends. Adding weight to our regular features for diabetics, hungry kids and Jains among others, are very interesting articles by our contributors. I would like to thank Yogi Ashvini, Khetsi Maithia, Dr. Surya Bhagwati, Bhavvikk Sangghvi, Nupur Krishnan and Naini Setalvad for their efforts. Have a Safe and Prosperous Diwali and New Year!